Gampopa Sönam Rinchen (Tib. སྒམ་པོ་པ་བསོད་ནམས་རིན་ཆེན་, Wyl. sgam po pa bsod nams rin chen) (1079-1153/9) was born in Nyal, Eastern Tibet, he first trained as a physician, hence his name Dakpo Lharje (Tib. དྭགས་པོ་ལྷ་རྗེ་, Wyl. dwags po lha rje), the Physician of Dakpo (the name of the province in which he was to spend many years), became ordained at the age of 26 after his two children and wife died in an epidemic. After studying and practising the Kadampa teachings, at the age of 32 he met Jetsün Milarepa, of whom he was to become the foremost disciple. 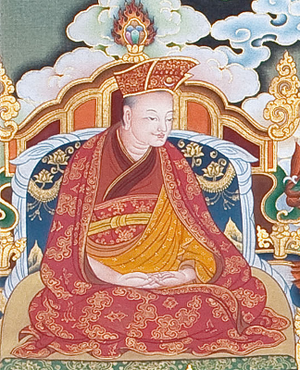 His own disciples included the first Karmapa Düsum Khyenpa (1110-1193) and Phagmodrupa Dorje Gyalpo (1110-1170).